I have this sweet fairy card today and I have used my watercolour paint to make this background. To make my card base I trimmed down a piece of Blu Navy Nettuno Linen Effect Card 280gsm to 4 1/8 and scored at 5 7/8. I then trimmed down a piece of White Card Hopsack 255gsm for my card front. Once this is done I used my watercolour paints to make the night time sky. I added the blues, pinks and yellows first before adding the black paint. You will then need to use your heat gun to dry this or you can leave it for a few hours to dry. I then stamped the fairy images with Versamark ink and used black embossing powder to heat set this. I used a piece of White Card Super Smooth 250gsm and very gently watercoloured the images in. 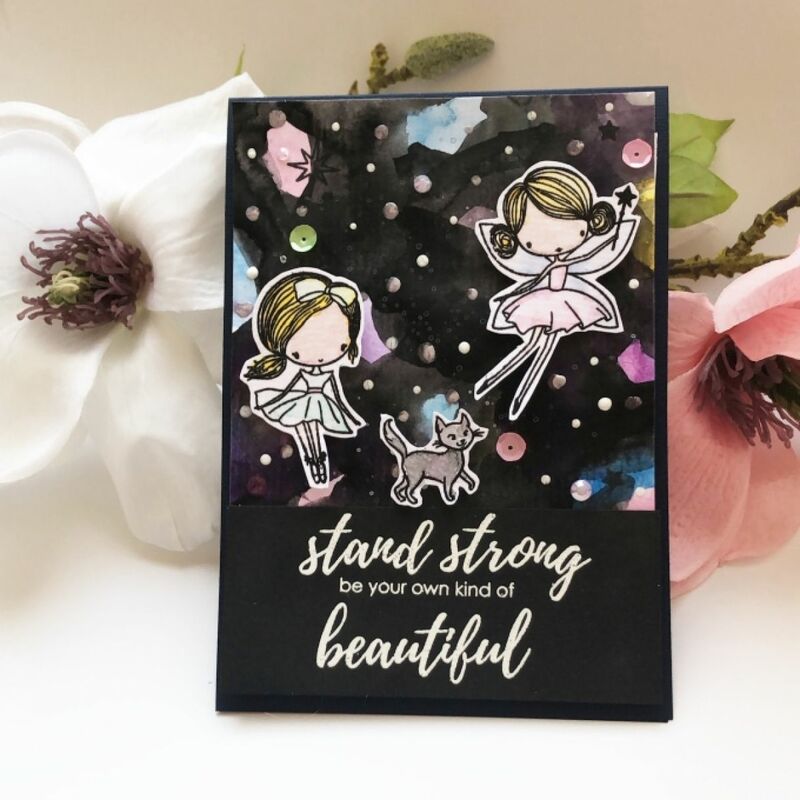 If you use embossing powder your paint should not run. I then trimmed down a piece of Black Plain Card 250gsm and heat embossed the sentiment using some white embossing powder and my heat gun. I adhered this to my card front using some Stick it! 3D Foam Tape 9mm. I then adhered the whole panel and my images to my card base using some more Stick it! 3D Foam Tape 9mm. To finish off the card I used some Anita’s PVA Tacky Glue 60ml and added some sequins. I then added some white nuvo drops to the card to make them look like stars in the sky. I had so much fun experimenting with watercolour paints onto different card stock. I always use a small amount of water when using watercolour paints so that the card doesn't get too saturated and rip. I hope you give this a go you will have so much fun!